You must make reservations at least 5 minutes in advance of the time at Belcampo - Oakland. 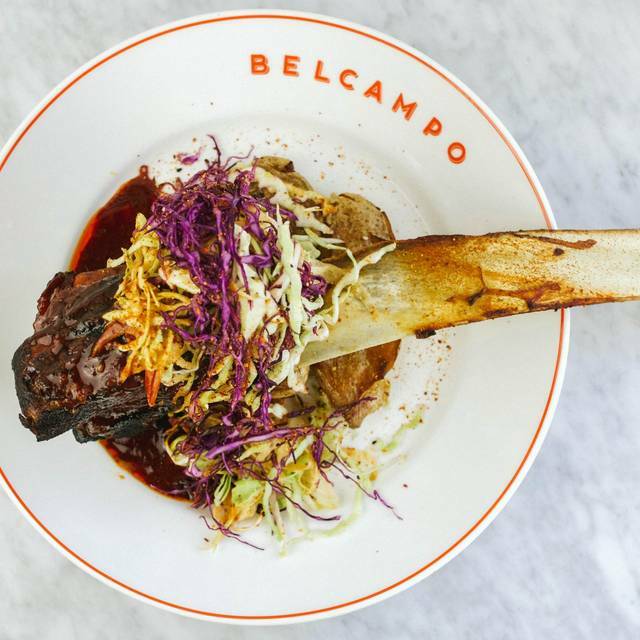 At Belcampo restaurants, our globally-inspired menu is packed with America’s best meat—compassionately and sustainably raised at our farm in Mt Shasta, California. Because when fine dining meets good-for-you and good- for-the-planet, everyone wins. All salads have 7oz of protein! Fresh Catch Weight Varies. Wild, small fisherman's catch from "dock to dish,"
Unfortunately this time dinner at belcampo was hugely disappointing. Service was lethargic but friendly and the menu did not accurately reflect what was available. While some food was quite good, other meals were just bad. I’ve been to Bellcampo many times. Food was great, service kept missing . No steak knives until we asked, drinks were empty for extended periods of time, and one drink completely forgotten. Hello JohnW! My name is Gina and I am the GM of Belcampo. Thank you so much for your feedback. I truly appreciate it as it helps us make changes and learn. I am glad to here the food was enjoyable, sad to hear the service was not. I have some new servers that I am working hard to polish and shine. Those little misses do add up and will make or break a dining experience. John, when you visit us again please ask for me as I would love to meet and make sure you are taken care of. A great first experience. Staff and food were top notch. Will return. Hello CaseyD! Thank you for your feedback. My name is Gina and I am the GM of Belcampo. I am so glad to hear that your most recent visit was a good one. On your next visit please ask for me as I would love to say hello and meet you. Thank you catherinec! My name is Gina and I am the GM of Belcampo. I appreciate your feedback. Indeed the lamb burger is one of my favorites as well. Glad you like it. And the meat counter is wonderful. Our meat quality is really spectacular. Makes for a wonderful meal at home as well. Please do look me up on your next visit catherine, I would love to meet you. Hello! I am so glad to hear you enjoyed yourself! My name is Gina and I am the GM of Belcampo. I sincerely hope your correct drinks were delivered. Please let me know next time you come in as I would love to buy you a drink and get it right the first time. Cheers! Best restaurant I've been to in years! If you love protein, you will LOVE Belcampo. Lovely location; great meat; friendly helpful staff. Hello Tracy! My name is Gina and I am the GM of Belcampo. I am so sorry your second visit was not a great one. We are ALWAYS more than happy to remake food if it is not to your liking. Seasoning should be spot on of course and food should be consistent. Please allow me to make it up to you. I will reach out in a private message. Thank you so much for your feedback, it truly helps us move forward and make changes when needed. Food and service were excellent. We had an enjoyable evening. The location and ambiance is excellent! The food was good but the portions were pretty small for the price. Fantastic Meal and very nice server! They only serve pasture raised & finished beef and it is outstanding. Portions are generous with out being huge. Hamburgers are really great & location is perfect on the waterfront at Jack London Square. Ambiance was top-notch. Service staff was friendly, helpful, courteous, and very accommodating. You notice the quality of their food when you take the first bite. Everything about Belcampo was so w h o l e s o m e and I will be recommending it to all my friends and family! Thank you LizM! So glad to hear you had a great experience. My name is Gina and I am the GM of Belcampo. Indeed our quality meat inspires everything we do. From the way we farm to the way we treat our guests. Thank you for your feedback, and please let me know next time you come in so I can say hello. We had several items from the lunch menu...all were very good except that two lamb burgers were not cooked to order (medium rare). They were more like medium well in terms of color, but were still juicy. When that was brought to the attention of the wait staff they offered to replace the burgers. We said thanks, but no. They ended up comping a side order and provided a Cookies and Milk dessert for free. We appreciated that and it was an appropriate response. We will go back because the food is compelling. The beef burger order was medium rare as ordered and awesome. Hello JerryB! Thank you for your feedback. My name is Gina and I am the GM of Belcampo. I am sorry to hear the lamb was overdone. (That lamb burger is my favorite thing on the menu). I am however very glad to hear that you brought it to our attention and my staff replied appropriately: offering to remake the burgers. Always makes sure to let us know when something is not exactly as you want it, we are happy to redo. And please let me know next time you visit us as I would love to say hello. This is my second lunch here and it didn't disappoint any of us. Cobb salad delicious, steak salad also delicious as was the Belcampo burger. Will return again to try either dinner or weekend brunch. Hello BonnieW! My name is Gina and I am the GM of Belcampo. Thank you for your feedback. I'm very glad to hear that both of your visits were good. To be honest the lunch menu is my favorite. Brunch is pretty great too! Do let me know when you would like to come for brunch as I would like to say hello. Always a great experience! One of our ‘go to’ restaurants. Thank you BillB! My name is Gina and I am the GM of Belcampo. The Farmers Market indeed fills ours Sunday brunch with a lively vibe. Thank you for the positive feedback. We appreciate it. My family enjoyed the experience. First time for several of them. On our daughter's last evening at home from spring break, we waited 15 minutes for our waitress to take our order; 10 minutes for our drinks; another 15 for our appetizer/salads. Our portable heater did not work and we were not offered to move tables until we decided to move on our own after we notify the waiter. After 1.5 hour after we sat down, we still did not get our four entrees. We were starving and had no explanations for the delay. 3 tables of patrons who were seated after us had eaten and left, we still had not received our food. We told the manager we want to just leave and were so frustrated. We were not offered any explanations for our slow service. They were completely under-staffed and were incompetent in customer service. Hello. My name is Gina and I am the GM of Belcampo. I am so sorry your experience on Friday 3/15 was so bad. it sounds like from start to finish we failed you. We strive for (and are very capable) much, much better than that. Please accept my apologies. I realize this does little to fix the situation as you wasted a precious last night with your daughter. Allow me to make it up to you. I will reach out to talk details. This is a meat-lover's paradise, although there are other things on the menu... Food is generally quite good, although obviously meat-centric dishes shine more than, say, salads. The "big chop salad" is really a sad effort - especially at $16. That said, the service is friendly and efficient, the space itself is quite beautiful, and it's a great option for a low-key, high-quality meal in Oakland. And the burger (I tried my daughter's) was out of this world. Thank you Jennifer for your feedback. My name is Gina and I am the GM of Belcampo. I am glad to hear that service and meat were a hit, but sad that the Chop Salad missed the mark. I love our salads, esp the Cobb. I will pass along to my chefs and take another look at the Chop. It should be big and inviting for sure. Thank you again! Thank you SaraK! My name is Gina and I am the GM of Belcampo. Im so glad to hear that service and food were on point. Please let me know when you would like to return as I would love to say hello. Belcampo is always lovely, and it was nice to visit again. Super yummy but it’s pricey! Thank you DanaW! My name is Gina and I am the GM of Belcampo. Our food is yummy and that is due to our exceptional quality of meat. I am aware that this translates into a higher cost as we do invest quite a bit of time and effort (and care) into thoughtfully raising our cattle and foul. My favorite thing on the menu is actually one the least expensive, the Double Fast Burger. Its available at lunch/brunch (no dinner) for $14. Its so good that LA Times ranked it better than Shake Shack! I love going to this restaurant...the food is great, nice happy hour if you arrive early and always easy to have a table conversation sitting inside or out. Menu is perfect, something for everyone. Service was awesome and was very accommodating. Will be back definitely! As a chef I keep my opinion to very specific details as to what I consider what may need some work or just don't work, my wife and I shared the Queso Fundido as Mexicans this was something that we had to try, in the homeland this dishes are the get together food so it was a most. The presentation was done nice, some things that we are not just to see are onions, cilantro, beans, lime and tostadas in this dish, so it was a surprise to see it on the Queso, we dig in with open mind since this was new to us and this are the thinks that I will like to share from this dish. But Burger and Steak are to die for my wife is pretty picky about burgers this 28day-dry age burger takes the cake tallow fries, caramelized onions brioche bun HEAVEN! Steak was also awesome but my wife was on to my burger, we'll definitely come back with the whole family we like to eat and we appreciate great food and Bel Campo with out of doubt has it. My comments are done with all respects to everybody working the BOH and FOH as a now first hand how stressfully can be to hear from some customers thank you. Absolutely the best burger I've ever eaten. And they truly will cook it medium rare if that's how you like it. The beef has so much flavor and the carmelized onions are cooked to perfection. I love the burger so much it's hard for me to try another entry. But I do hope to someday. My roommate always gets the Lamb burger which she loves just as much. The fries that come on the side are very good too. I ordered the greens on the side a couple times but I didn't enjoy the tart dressing that they come with. I look forward to taking my out of town guests to Belcampo when they visit. It's a great place to eat. And there staff is always super friendly. This is a restaurant that never lived up to its potential. At first the service was a disaster. We waited 4 months to go back to see if it improved. It had, unfortunately the food seems to have lost its flavor and become bland, not good enough for a date night. The portions were small. The space is lovely, especially when you can eat outside, but you have to be able to enjoy what you eat. Great, I’m celiac and wanted some great food. We had wonderful service and awesome GF food. Definitely going there again. Would recommend to anyone and everyone! Brought my client and I for the first time try! This was my second time dining at Belcampo. The first experience I had there was not positive - service was very slow and the meat I got was very tough. This experience was the opposite - great service and all tasty dishes. An absolutely wonderful experience. Terrific food, top-notch service, beautiful surroundings. I really couldn't recommend it higher. I can't wait for my next visit. I specified gluten free for my cesar salad and it came with crutons. I sent it back and it tasted as if they washed the lettuce, still full of water and put back in bowl. The salad was not edible and server was clueless.